Why do video games make such bad movies? 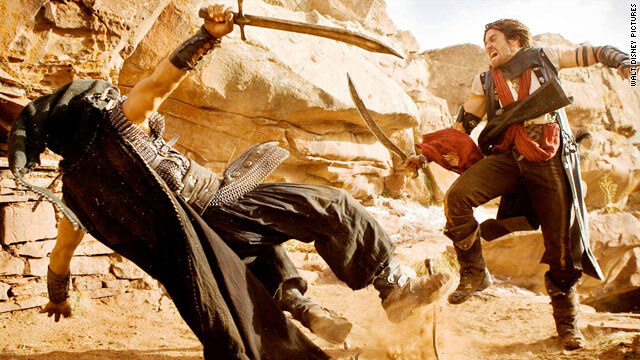 "Prince of Persia" has struggled at the box office and is just the latest video game to flop on the big screen. Editor's note: Scott Steinberg is the head of technology and video game consulting firm TechSavvy Global, as well as the founder of GameExec magazine and Game Industry TV. He frequently appears as an on-air technology analyst for ABC, CBS, NBC, FOX and CNN. His most recent book is "Get Rich Playing Games." (CNN) -- Do you think the idea of Jake Gyllenhaal playing a time-traveling Arabian swordsman seems far-fetched? Then consider Raul Julia as a gravity-defying, Third World despot, or Sir Ben Kingsley taking on the role of a bloodsucking vampire king. Sadly, as illustrated by "Prince of Persia," the latest film adapted from a popular video game, the more things change, the more they play the same. Decades after the debut of "The Wizard," a thinly disguised, feature-length Nintendo commercial, the marriage between Hollywood and gaming remains rocky at best. In other words: Movies based on video games stink. "It often comes down to money, as movie studios frequently choose to make films based on the franchises that sell the best, not those with the most cinematic potential," said Corey May, co-founder of Sekretagent Productions. May, the lead scriptwriter for UbiSoft's multimillion-selling "Assassin's Creed" games, believes a compelling universe and fascinating cast of characters are what's needed for a credible celluloid adaptation. But such luxuries are often rare in a business where features like better graphics and extra multiplayer modes are generally perceived to add more value than a compelling yarn. Few development studios today -- save the likes of Telltale Games and Valve (makers of the popular "Sam & Max" and "Half-Life/Portal" franchises, respectively) keep full-time writers on staff. Fewer still incorporate them in the creative process from day one. Worse, the vast majority treat story as an afterthought, and continue to rely on jobbers tasked with tying oftentimes wildly disparate plot elements together toward the end of development. "For many studios, story remains a hard sell," said story designer Rhianna Pratchett, who has penned narratives for games like "Overlord II" and "Mirror's Edge." "From a short-term perspective, it can be hard to see how a better plot can translate into an improved ranking on the retail charts." In essence, artful prose and widespread commercial appeal seldom go hand-in-hand in an industry where plot exists primarily as a device to keep players moving from one action sequence to the next. "Final Fantasy XII" writer Miwa Shoda says on her Twitter feed that she's been told that role-playing games, those verbose, dungeon-crawling fantasy or sci-fi epics, "don't need storylines." From a director's perspective, it's hardly the same stone from which cinematic classics such as "Citizen Kane" or "Casablanca" were carved. Rotten Tomatoes' list of Best Video Game Adaptations tops out with 2001 animated feature "Final Fantasy: The Spirits Within" -- a notorious box-office flop that topped the list with an aggregate review score of just 44 percent. Still, gaming franchises like "World of Warcraft" continue to be optioned for films. The latest is Legendary Pictures' forthcoming translation of the popular futuristic role-player, "Mass Effect." At the crux of the problem lies a curious dichotomy, and one that frequently cuts both ways. Most game makers would be hard-pressed to capture the subtle nuances, insightful dialogue and human element of films like "Juno" or "Lost in Translation." At the same time, filmmakers such as Paul W. S. Anderson wrestle in vain to adapt hit interactive properties like "Mortal Kombat" or "Resident Evil" into tangible narratives. You can't blame the quality of the source material. In fact, the gaming industry, which began with text adventures like Colossal Cave and Zork, is quickly maturing and rediscovering its roots, courtesy of increasingly literate works like "God of War III" and "Alan Wake." And nail-biting thrillers such as "BioShock 2" and "Heavy Rain," both of which raise the bar for dramatic storytelling, sell in the millions. The problem with successfully adapting video games into hit Hollywood spin-offs may lie in the way in which stories for both mediums are designed and implemented. Game makers chasing the dream of playing George Lucas or Steven Spielberg will always strive to coax human emotion and convincing drama from increasingly photorealistic virtual elements. The Hollywood machine, in its endless chase for big bucks, can't help but exploit the latest hit interactive outing, often failing to realize it's often a specific gameplay mechanic, psychological meme or technical feature that makes the title so compelling. Both sides may very well continue to look down in disdain on the work that the opposite is doing, which can doom any collaborative efforts. But where the two roads truly diverge is in the way stories are fundamentally told. Films offer a single, linear tale that's open to individual interpretation, whereas games are meant to be experienced differently and in a multitude of ways by every player. Movies are many times inherently dense, layered with shades of subtle coloring and perception. Video games are often more one-dimensional, primarily designed to keep players steadily clicking away or tapping buttons. Passive and interactive, these two means of spinning yarns couldn't be more unique or disparate. What works for one seldom translates well to the other. But I'd like to think there's hope yet. After an extended detour that began in the early '90s as mindless 3-D action and first-person shooter games replaced the thoughtful adventures of yore, game makers are increasingly putting stock in storytelling again. If they can continue to raise the bar for virtual narrative, Hollywood regulars like Jerry Bruckheimer may have a simple way to break the curse that's plagued gaming adaptations since 1993's "Super Mario Bros."